Just as a batsman must select the right club and execute the proper swing to hit the ball, your challenge is to choose the right type of online recruitment assessment tool and deploy it properly in your hiring process to ensure that you are able to identify talent that hits the performance mark. Choosing the right assessment tool and implementing it properly is crucial to the success of the organization. By adding online assessment tool to the candidate selection process, companies of all sizes can get a better handle on the vast pool of candidates applying to open positions. While technology may be responsible for the increase in applications, it also provides an answer, by making it much simpler to integrate online assessment tool into the hiring process. What kind of results you should expect from an online assessment tool? 1. Reduced administration - Greater flexibility and removes the burden of test administration. 2. Automatic scoring - Results are delivered at the touch of a button, significantly reducing hiring manager’s workload – fast feedback is motivating for candidates too. 3. Not just data, complete test analysis - Hiring managers need enormous computing power, data science, and smart algorithms, all working together to quickly make sense of data for them. In other words, measurable insights those are easy to see. 4. Instant diagnostic reports - Detailed reports, delivered straight to your desktop that enables you to analyze results with ease. 5. Find quality candidates - Employers can increase the likelihood of hiring high-quality candidates by using online assessments to help screen and select the best candidates for jobs. 6. Eliminates human error in grading - Automated grading process ensures that test scores are objective and free of human error. Proven in research to be more reliable and accurate than human scores. 7. Minimize the risk of bad hires - Online assessment can eliminate up to 50% of unqualified applicants easily and on the spot ultimately decreasing the possibility of bad hire. 8. Minimize hiring and training costs - Do you know the cost per hire? The cost of hiring a single candidate is rarely calculated. Online assessment tool improves business by lowering hiring and training costs, and improving productivity. 9. Improve hiring decisions - Pre-employment skill testing can assist you in achieving the proper job fit between the applicant and the job you are hiring for. Matching the right applicant to the right job leads to increased employee satisfaction, increased productivity, and reduced employee turnover. 10. Less time-consuming hiring process - You can reduce up to 90 percent of time spent on the unnecessary elements in the hiring process that directly increase the costs on low-value aspects of recruiting. 11. 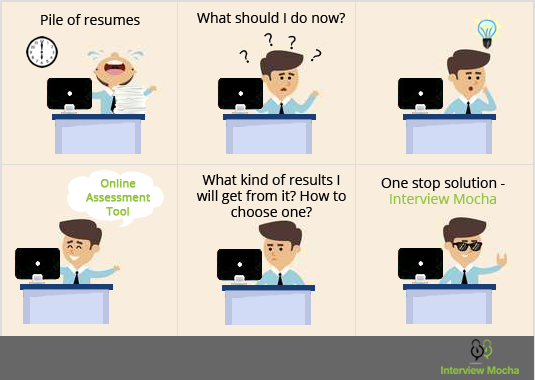 Reduce unnecessary efforts and hassles – The online assessment tool reduces the efforts and hassles involved in screening resumes, scheduling interviews, and organizing test. 12. Increased productivity - Reducing the time spent on unwanted activities will lead you and your team to focus on other important tasks, increasing your productivity. 13. Minimize legal risks of hiring - Online assessments remove a lot of the opinion and personal bias from hiring which allows for better decision-making. Objective hiring based on scientific test results can protect you from lawsuits in the event an unhappy applicant makes a claim. 14. 24×7 recruitment partners - An online testing platform can be integrated with a company’s website allowing applicants to submit their details and appear for relevant assessments. This is done automatically by the system without any manual intervention. This creates a large pool of screened candidates who can be called whenever a vacancy matching their skills arises. This helps an executive recruiter to seek out the best person quite easily rather than choose from the limited number of applications in hand. 15. Providing facts and evidence – Online assessment tool gives employers to analyze the "big picture" trends of candidates’ performance with drill-down detail to individual candidate report and test analysis. 16. Eliminate Bias – Using online assessment, hiring managers and recruiters can base their decisions on hard facts – a candidate’s test results – instead of depending on a resume that may bring biases. Online assessments help companies avoid discrimination against candidates based on gender, age, or race since hiring managers will base their decisions on a candidate’s proven competencies. 17. Less storage space - Online assessments take up less storage space in respect to keeping records than paper. All data can be stored on a single server. 18. Wider reach - Online assessments allow candidates from distant locations to apply for jobs and appear for the initial round of testing. This improves the reach of the recruiter. The online assessment tool is not just helpful from the employer’s perspective but also applicants profit as well. How? 19. Flexibility - Candidates can take a test from anywhere that provides access to the Internet. 20. Opportunity - Online assessments give a fair shot to all candidates to prove themselves beyond their resume with a standard test. Job seekers get the benefit of rapid screening, helping them figure out where their “perfect job” may be. 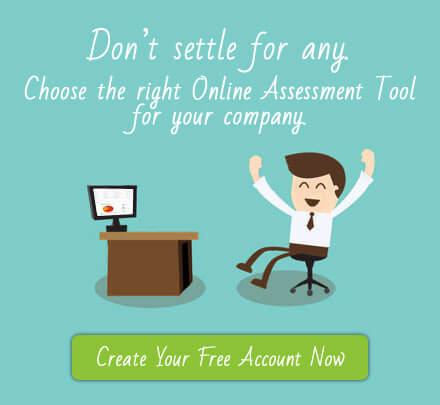 How to choose Right Online Assessment Tool? There are a number of key factors that you should consider when planning your assessment program, including the purpose of the assessment, job type and level, validation and reliability requirements, legal defensibility to support the implementation of the assessment system. Ask these questions to evaluate any assessment tool you are considering. If you cannot answer "yes" to all of these questions, keep looking for a tool that meets the criteria. Or maybe you can settle for Interview Mocha's pre-employment skill testing as it has the answer “yes” to all these questions. Does the assessment tool adequately evaluate performance relevant to the desired outcome? Does this assessment tool adequately address the knowledge, skills, abilities associated with the intended outcome? Will the assessment provide information at a level appropriate to the outcome? Are the assessments normed to interpret the results? Will the data accurately represent what the candidate can do in an authentic or real life situation? Is the marking scheme consistent; would a candidate receive the same marks for the same work on multiple evaluations? Does the assessment provide data that is specific enough for the desired outcomes? Does the assessment provide emphasis to both theory and practical questions? Are there any simulations used to assess the knowledge of the candidate? Which? Will the data derived from the assessment help to improve the quality of assessments and consider previously used channels to source candidates? Is the tool free of cultural, language, and gender biases? Does the online assessment tool maintain the security at each level? Selecting an appropriate assessment system is critical to the success of building a high-quality team. With the right tool, you can easily hire better and faster every time. With Interview Mocha’s online assessment software, you be able to double your success rate for hiring with just a few carefully designed assessments. Interview Mocha has 1000+ ready to use skills tests. Name a skill and Interview Mocha has it all. Interview Mocha provides skills related tests so that employers can evaluate candidate’s knowledge on a particular skill or concept. Concept wise or framework wise tests have been created by our content matter experts. The questions are structured that a particular test will have a proper balance of easy to hard questions. Each test is designed in such a way that the results can be interpreted in a relative manner, i.e., it establishes a frame of reference or a point of comparison to compare the attributes of two or more individuals in a common setting. Interview Mocha tests measures what it says it measures. Interview Mocha offers you the tests that are valid and reliable. A balanced mix of theory and practical questions so that an employer can easily evaluate candidate’s knowledge on various concepts and coding too. Interview Mocha also has several simulation techniques to evaluate practical knowledge of the candidate. Based on real time scenarios the skills and abilities of candidates are evaluated. Interview Mocha Analytics offers you a set of integrated data and hiring analytics, reports designed specifically for the needs of hiring managers and recruiters. It all starts with understanding the skill test at the moment — getting the right insights and then making right hiring decisions. If you need custom development on top of Interview Mocha, our Restful API could be the perfect way for you to set up specific business workflows and extensive integrations. Interview Mocha is 24×7 devoted to your success and every step of the way. We’ll start with a thorough need analysis for your business. Then we’ll help you get up to speed, with full support and skill tests. Isn't that enough! Now, why not just go and give it a quick try! Online assessment tools for recruitment use systematic, often highly sophisticated methods to match people to jobs that suit their unique skills, talents, and interests. The benefits of these tools have been demonstrated through thousands of public and private research studies. Thanks to recent increases in technology, the assessment tools are now more accessible and inexpensive than ever before. The internet now makes it possible for any company to recruit like Apple as long as you’re willing to dedicate the effort to doing it properly. The Internet is rapidly becoming the preferred method for delivering pre-hire assessments.